No matter your age, taking music lessons in Frisco, TX is an invaluable investment that you will never regret. 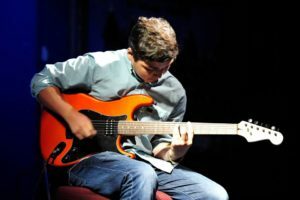 For most people, the decision to take music lessons is simple enough, but deciding what kind of lessons and which instrument can take considerably longer to sort through. While the idea of learning a new skill or simply choosing which instrument you would like learn may seem daunting at first, these four benefits of taking music lessons in Frisco, TX will far outweigh any doubt or questions you may have. Studies have demonstrated that taking music lessons even late in life can still have significant impact and benefits on the brain. Your body will benefit as well, as music and the playing of music have been linked to improvements in pain, immune system functionality, nervous system, skeletal system, and cardiovascular system. The perseverance and patience required when you learn a new instrument will help you improve your attitude and cultivate character traits that will be valuable to you for the rest of your life. Some of those character traits include self-confidence, self-discipline, delayed gratification, respect for others, humility and creativity. If you take music lessons in a group setting, you will quickly learn to become comfortable with two things that can be a struggle for most people — making mistakes and receiving feedback or constructive criticism. The fact that this is all occurring with an audience may make your pulse quicken a bit, but the thing to keep in mind is that both will occur in a supportive environment. You will be surprised to see yourself taking this new comfort with making mistakes and receiving criticism into other scenarios of your life and excelling. This makes you more thoughtful and mature and will help people see you as a leader. One of the more beautiful benefits of taking music lessons in Frisco, TX is the unbelievable amount you will learn about other cultures as your studies progress. Different music by different composers, as well as the instruments required for each unique composition, will help you appreciate the sounds and traditions that make up cultures all around the world. If you are ready to take music lessons in Frisco, TX Matt Burk Music Studio caters to students of all ages. Our instructors build lessons around your interests and favorite type of music. Call us today at (469) 353-6100 to schedule an interview with one of our instructors. For advice and piano lessons for your child in Frisco TX, contact Matt Burk Music Studio at (469) 353-6100. For the best choices in music lessons Frisco TX, call Matt Burk Music Studio at (469) 353-6100 to benefit from musical training at any age! Have you always wanted to play the piano? Maybe you’ve wanted to get your children started with piano lessons in Frisco TX. Whatever the reason, playing piano brings a new joy to your life. The gift of music can make anyone’s day brighter! If you’re considering signing your kids up for piano lessons in Frisco TX, you should go for it! Here are the top five reasons you should sign them up as soon as possible. Every rock band needs a bass player, and taking bass guitar lessons in Frisco TX is a great way to sharpen your rock ‘n’ roll skills. Together, the bass player and drummer make up a band’s rhythm section, providing the backbeat and driving the group’s sound.